Whether it be a ceremony, reception or rehearsal dinner, Tria’s picturesque atmosphere and award winning menu options create an unforgettable experience. Our staff works closely with you to plan every detail to ensure your special day is everything you imagined. Your wedding day is an occasion that should be beautiful, breathtaking and uniquely you. At Tria Restaurant, Bar and Event Center we will help you create a personalized, truly unique experience. Tria offers both indoor and outdoor wedding ceremony packages — both guaranteed to set the perfect backdrop for your big day. Let us help you with happily ever after. Please take a moment to review our Wedding Ceremony Package. Our wedding professionals can assist you in creating an event that remains within your budget, yet ensures a truly memorable occasion for you & your guests. If you are looking for the best place to host your celebration, look no further. 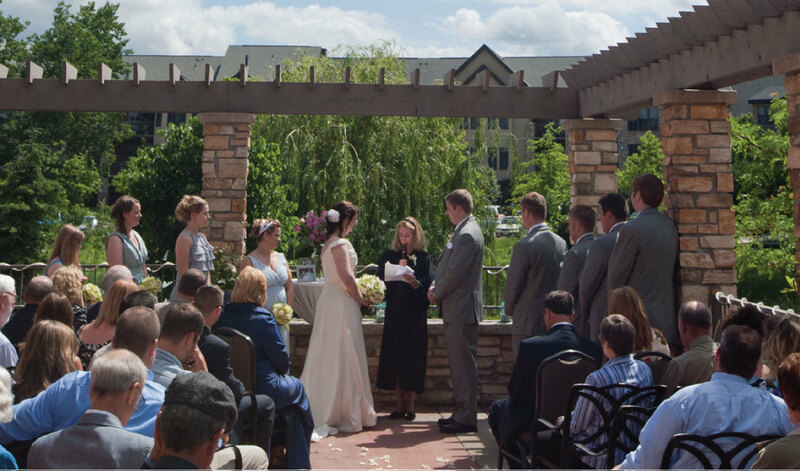 Tria Restaurant is your wedding reception venue, located in North Oaks, MN. The natural wood & stone, wood burning fireplaces, art & accessories all depict our commitment to creating a delightful experience for you and your guests. When planning the perfect wedding, Tria Restaurant is yours truly. Whether it is a big gathering of family & friends or a more intimate setting with immediate family & close friends, we have the space & charm to make your wedding celebration unforgettable. The Restaurant, Bar & Patio are uniquely designed to provide you with a beautiful banquet hall for as many as 200 guests. To make your Minnesota wedding truly special, each of our distinctive areas sets the mood with cozy fireplaces and award winning food. The Market provides an intimate dining experience for up to 24 guests, perfect for wedding rehearsal dinners, engagement parties or grooms dinners. The Jerome Room can accommodate up to 132 guests for a reception.